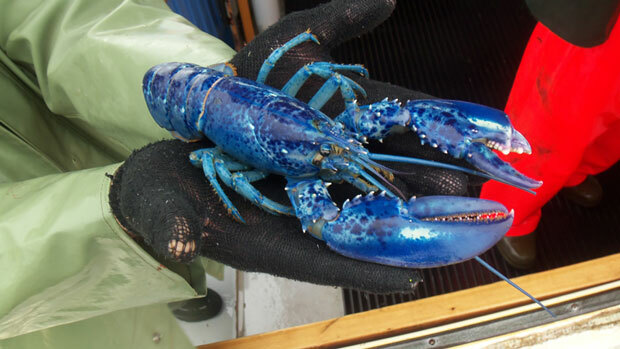 His gorgeous electric blue color is apparently caused by a rare genetic mutation seen in only one in every four million lobsters! NBC reported that this guy will now be living out his days in an aquarium where he can be admired for his lovely coloring. 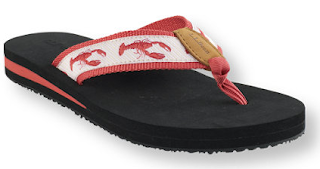 Show off your summer pedicure in these cute lobster flippies! If you're more of a foodie than a fashionista, how about adding this Mariposa Lobster Claw Bottle Opener to your kitchen or bar? And finally, I left the best for last... this lobster percale sheet set from LL Bean is too cute for words. 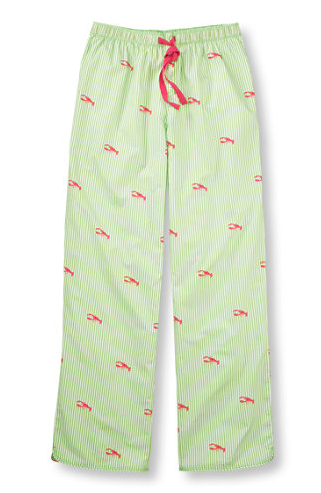 I'm SO very tempted to click that little "Add to Bag" button because these would look so stinkin' coastal and cute in our (newly) navy and ivory bedroom! I love, love, LOVE these lobstahs! Which coastal creatures are you crazy over - is it lobsters, seahorses, octopus, snails? 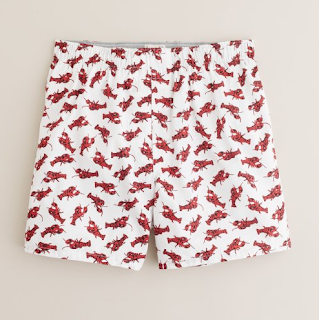 And have you spotted any lobster-print goodies I missed?? Do share! Yesterday marked the 100th anniversary of the launch of the RMS Titanic, and descendants of the men who built "the unsinkable ship" held a ceremony in Belfast, Ireland to help restore the city's maritime pride. 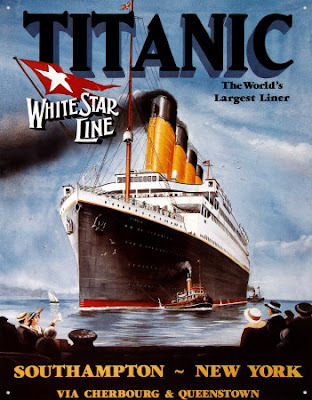 The Titanic was launched on May 31, 1911 - nearly one year later, on April 14, 1912, she struck an iceberg and sank on her maiden transatlantic voyage. 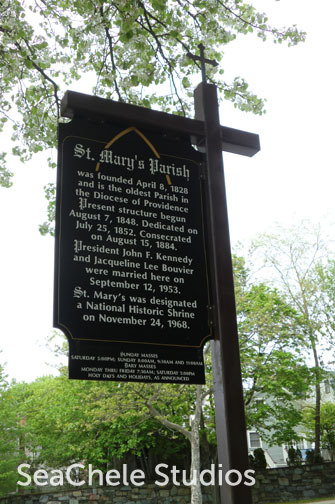 You can read more about the commemoration here. 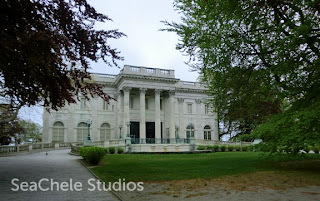 The hubby and I are just back from a few days away in Newport - the City by the Sea. Newport is easily our favorite place. If we won the lottery tomorrow, we'd be back there in a heartbeat - permanently! Enough of the daydreaming though... 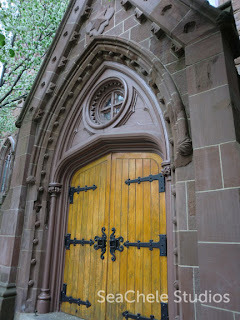 I wanted to share a wrap-up and some photos of our trip. 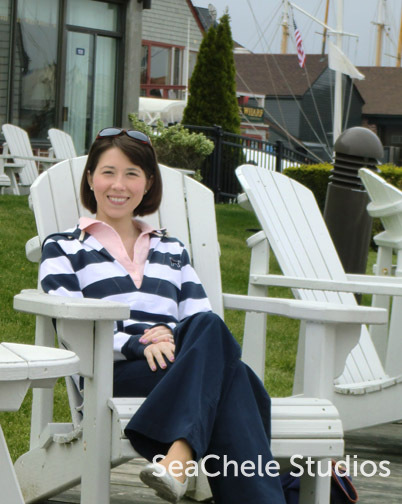 This visit we stayed at the Newport Harbor Hotel & Marina, and while our room wasn't as luxurious and lovely as where we stayed in Newport for our Honeymoon, the hotel's location couldn't be beat. Just step out the door and you're in Bowen's Wharf, which was wonderful! 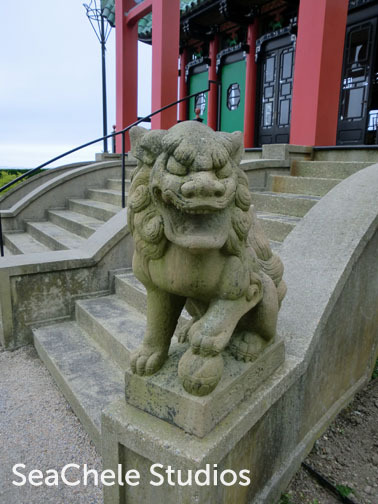 We had a light lunch here, looking out over the sea. 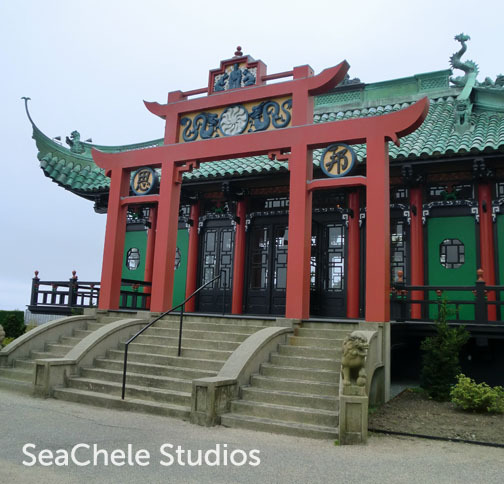 Detail shot of the tea house. 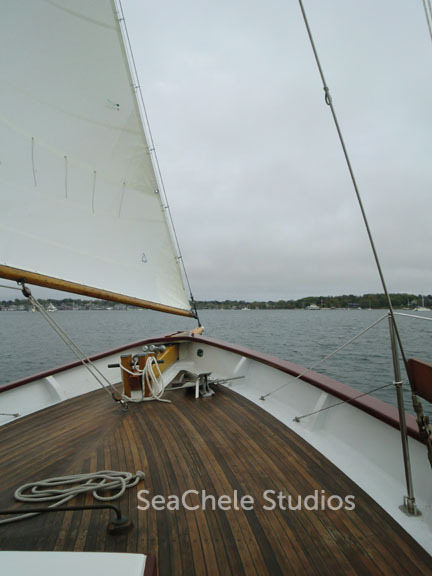 The bow of the Madeline in Newport Harbor. their wedding, in front of those same doors. 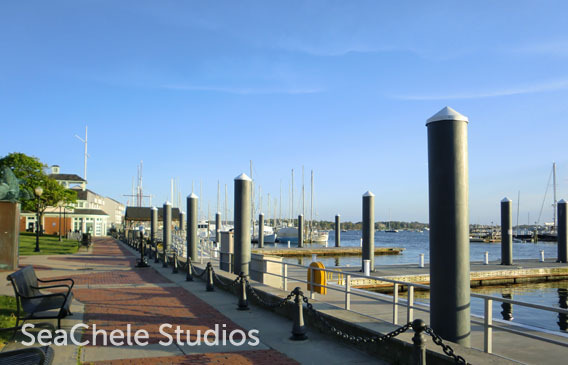 What city by the sea are you headed to this summer? I took an hour out of my Saturday this past weekend to sit down and whip up this seashell wreath for our front door. 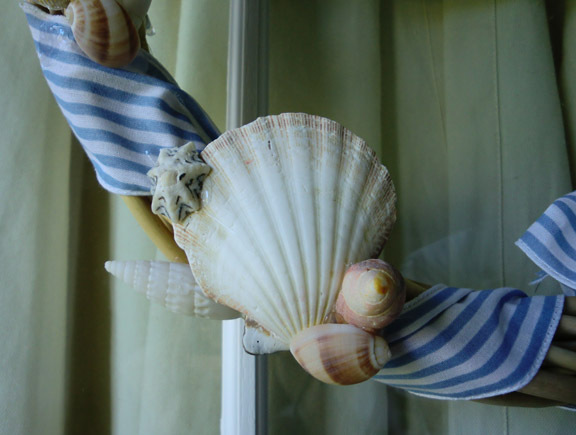 I happened to be organizing my craft closet and already had the glue gun plugged in to make some quick repairs on a decorative sign for our porch…and when I came upon my boxes and boxes of seashells, a lightbulb went on in my brain…shells + glue gun = awesome beachy door decor! I already had a ribbon-wrapped wreath from last summer but it definitely needed something, and I knew shells would be the perfect addition. I started by spreading out my shells so I could see what I had. Then I worked in small sections, going counter-clockwise from the bow on the wreath, trying out small arrangements of 3-5 shells and making adjustments before I actually hot glued them down. By the time an hour was up, I had a beautiful, summery (and most importantly, completed!) 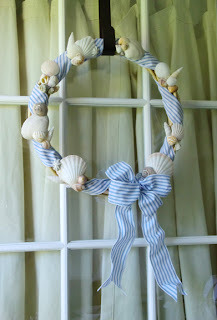 sea shell wreath to dress up our front door! 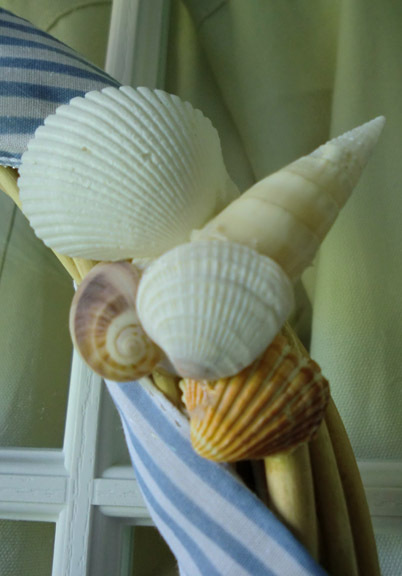 And as an added bonus, my shell wreath has extra special meaning since it combine shells from our honeymoon, my work out at Boston Lighthouse (a place very close to my heart! ), and childhood family trips to Cape May and the Florida Gulf Coast. Fabulous! So how have you put your seashell collection to good use lately? 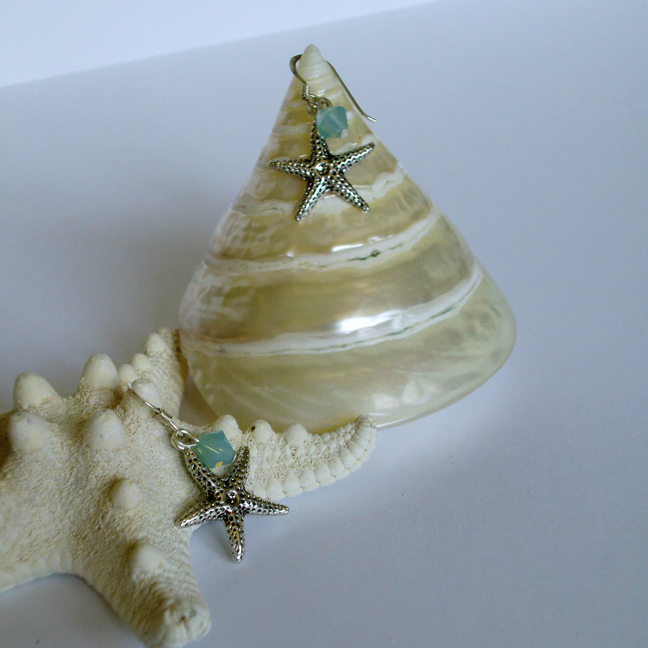 The store is filled to the brim with sea-inspired jewels to add some sparkle to your spring & summer outfits! 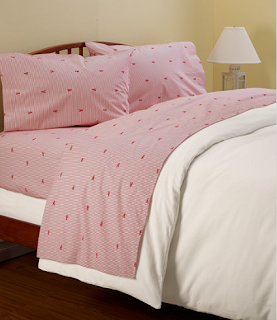 But hurry, this offer is only good through 11:59pm ET on Sunday, May 8th! 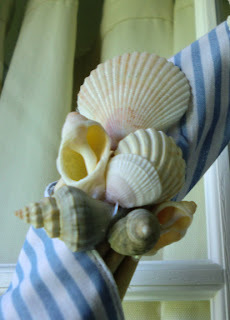 And the fun doesn't stop there...my darling penpal, Kate, over at Nautical by Nature is hosting a Shabby Apple Dress Giveaway. The winner gets to choose between Kate's 2 favorite dresses: the Azure Coast and the San Gabriel - you really can't go wrong with either one! (though I do admit to being a bit obsessed with the San Gabriel!) 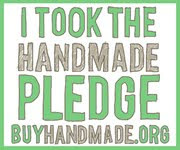 So scoot on over to her site and join in fun...you only have until tomorrow, so hop to it! 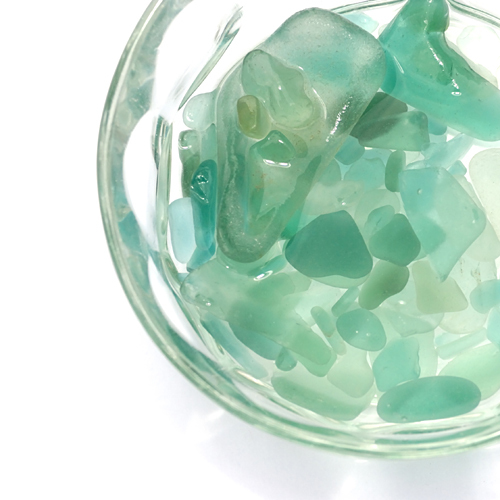 Did you know that sea glass is very porous, making it perfect for holding fragrance? Here's a quick and easy project to add a beachy touch to your home - or to give as a gift for a beach-loving friend! 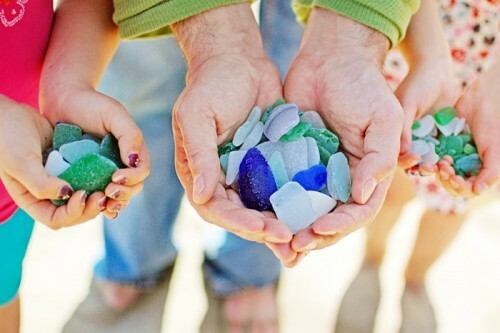 Gather up your favorite colors of beach glass and place in a food storage bag. Add 2-3 drops of an essential oil such as lavender or bergamot to the bag and shake to coat the glass evenly with the oil. Pour into a dish or decorative jar. 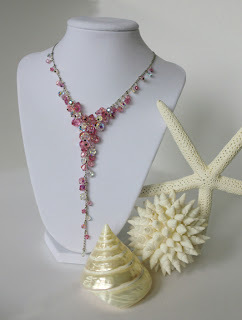 Add shells or smooth beach stones, if you'd like. How have you incorporated sea glass into your craft projects or decor? 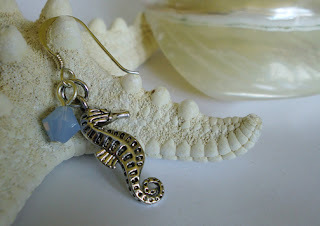 Since it's January - and cold, gray and snowy here - I've been escaping the cold with daydreams of beachy, summer days. And nothing gets me thinking warm summer thoughts better than a spritz of my favorite summery scent! 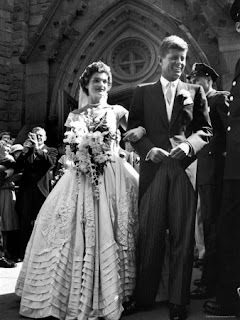 So I thought I'd share some of my favorites with you today! 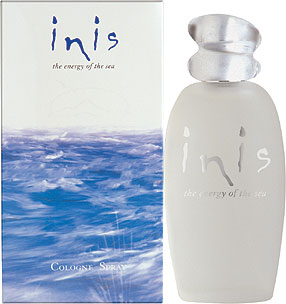 Inis (Energy of the Sea) has been my signature scent for years. It's an Irish cologne for both women and men with a scent that "embodies the coolness, clarity and purity of the sea." It has top notes of lemon, bergamot, neroli and marine notes blended with lily of the valley, and sandalwood. I love Inis because it has a really unique scent, and since I can only get it at my favorite little family-owned Irish shops, I'm supporting local businesses each time I need a refill! And Inis Cologne also contributes to the protection and conservation of whales & dolphins. Love it! 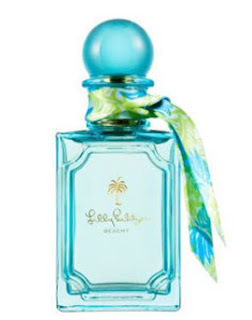 I'm currently maxed out on perfumes and body sprays, but the next time I start running low on fragrance, I'm looking forward to adding Lilly Pulitzer's Beachy to my collection. Beachy has notes of watermelon, citrus, marine air accord, jasmine, tiare flower, frangipani, salt crystals, amber and vanilla. It's light and smells amazing! A great summer scent! 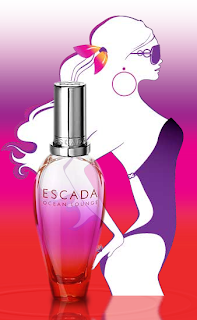 Escada Ocean Lounge is another great summer scent. Ocean Lounge has notes of strawberry meringue and lychee blended with plum and Anjou pear nectar. 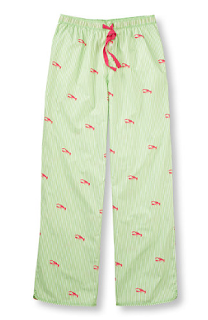 Definitely gets you daydreaming of blue sky days spent lounging on the beach with a tropical drink in hand. And who doesn't need a dose of that this cold, gray winter?! 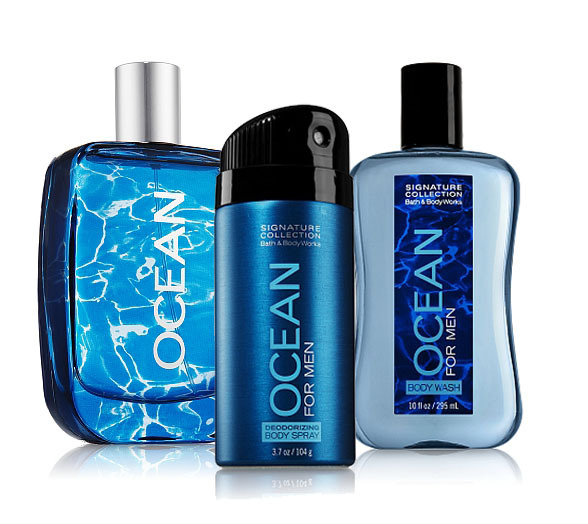 And I don't want to leave the guys out, so I'll share a scent for the handsome ones as well... My hubby has been using Ocean from the Signature Collection for Men, from Bath & Body Works. 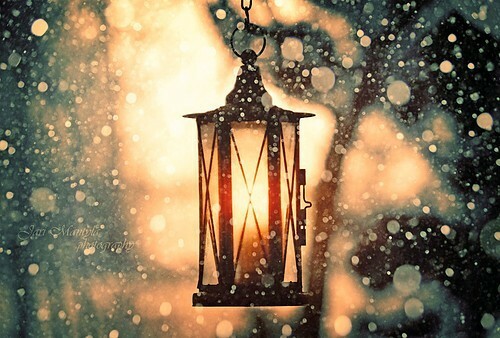 The key fragrance notes are Bergamot, Cypress, Nutmeg, Patchouli, Cedarwood and Vetiver. It has a nice, refreshing scent and is easy on the pocketbook too, at just $10.50 for the Body Wash, $12 for the Body Spray, or $29.50 for the cologne. Plus Bath & Body Works is always running those "Buy 3, Get 2 Free" deals so you can stock up! What are your favorite ocean inspired scents? 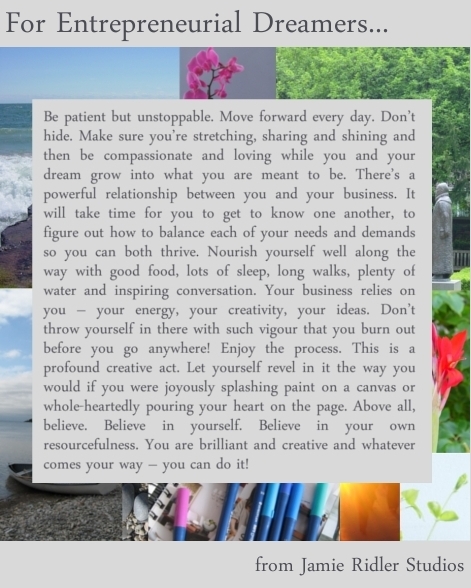 Wishing you all a wonderful weekend filled with time to laugh, stretch, rest, create...shine! Wishcasting Wednesday: What do you wish to enjoy? Over the last few weeks I've really run myself ragged - especially last week when I was dashing from errand to errand every night and frantically cleaning, cooking and decorating to prepare for our halloween party. A good night's sleep is always the first thing to go when I'm feeling frazzled - usually also followed by a complete lack of exercise and healthy meals. I am so there right now. 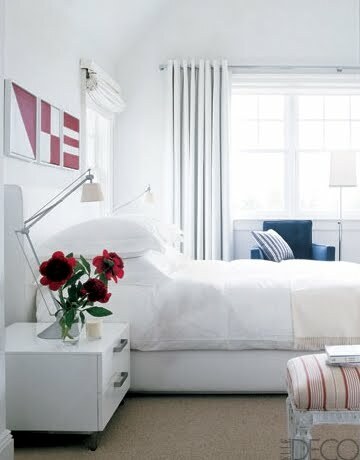 I think one day this weekend will definitely need to be declared a "Bed Day." 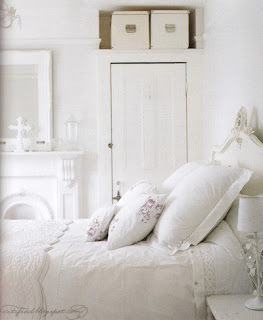 Just two more days in the workweek and then it's off to dreamland for me! What do you wish to enjoy? Play along at Jamie Ridler Studios.